Way back on February 23rd of 2016, we reported in a story on ANP that a huge fireball had recently struck the Atlantic Ocean even though most Americans were completely unaware of it as a game of ‘cosmic roulette’ continued in the heavens above us. Back then we also reported that according to Brian Cox, the Science presenter at the Daily Mail, “there is an asteroid with our name on it and it will hit us” and “we are at risk of being wiped out by asteroids – and we’re not taking the threat seriously”. The largest fireball to visit our planet since the one that exploded above Chelyabinsky, Russia in 2013, it released the equivalent of over 13,000 tons of TNT though it was quite unlikely anybody saw it happen 620 miles off of Brazil’s coast and ‘nobody saw it coming’. Also telling us that ‘impacts like this happen several times a year’ though mainly over oceans, we’re not the least bit surprised by the recent news from the NY Times that FEMA and NASA have been ‘rehearsing’ for the unthinkable – an asteroid strike upon Los Angeles. As ANP reader JoeJoe asked in a comment this morning on ANP, “how does a city do an asteroid drill? Besides run around screaming to TAKE COVER?” A great question JoeJoe…could drills EVER help to prepare us for such a situation? All the survival food in the world and the best underground bunkers in America likely won’t help if we’re living upon ‘ground zero’ and have no notice at all of incoming doom of if the monster approaching is the size of a ‘planet killer’. 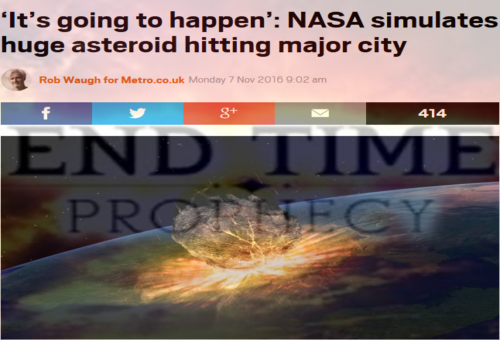 And as we learned in this October 31st story from the Daily Star that was vastly overlooked as America and the world focused our attention on the US presidential election, NASA recently issued a stark warning that the number of ‘apocalyptic asteroids’ hurtling through space towards our planet had increased by 50% in what they called a ‘shock discovery’. While such a possibility in itself might seem to be the ‘ultimate longshot’ and instantly reminds us of what happened to the dinosaurs, the fact that FEMA and NASA failed to detect a city killer asteroid in a recent drill should show America and the world just what we’re up against. 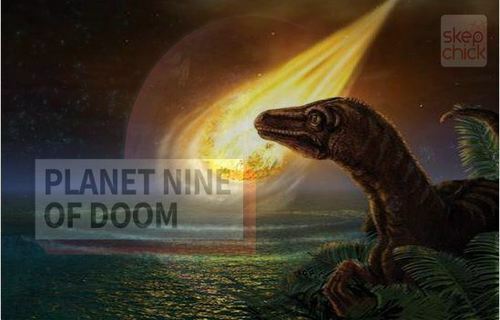 Especially after scientists reported they had discovered evidence of the mysterious ‘Planet Nine’ and warned that they believe the planet was responsible for periodic extinctions upon our planet Earth. Informing us that they believed that ‘Planet Nine’ was responsible for periodically ‘hurling’ space rocks into the inner solar system from the Kuiper Belt of asteroids, is the discovery of ‘Planet Nine’ and the 50% increase in apocalyptic asteroids the reasons that FEMA and NASA are now getting ready for something that we may not be able to prevent and we pray never happens in our lifetimes? As this new story from Mac Slavo over at SHTFPlan tells us, according to NASA, an asteroid impact upon Earth is going to happen sometime in the next two decades…they’re sure of it…and they’re preparing for ‘the big one’. “In the long run, it is an inevitability. Though major asteroids big enough to wipe out life across the entire planet are rare, scientists believe they have taken place and reset entire epochs”. Even Barack Obama’s ‘science czar’ John Holdren warned back in September of 2016 that we aren’t ready for an asteroid strike upon our planet while speaking of an ‘asteroid redirect mission’. Do NASA, FEMA and the Obama administration know something that the American people don’t know? If so, might we learn what that is from ‘President Donald Trump’? The mere fact alone that FEMA and NASA were unable to detect a ‘city killer’ in the recent drill helps to prove to us that we still have a lot of work to do if ‘Planet Nine’ is indeed responsible for the series of extinctions that have taken place upon our planet and ‘is coming back around’ for more. As this recent Daily Star story tells us, experts within NASA have warned ‘a catastrophic asteroid strike WILL happen’ – and ‘has carried out drills evacuating a whole city’. The scientists, along with FEMA emergency response teams, have simulated an emergency drill surrounding an asteroid impact on Los Angeles, US, on September 20, 2020. Starting from the present, the team set out plans to evacuate 18 million people from LA to get them away from the imminent impact by the 800-feet wide space rock. The drill was to work out how to evacuate the city over four years while quashing rumours and false information to make sure there are no casualties. This comes as NASA warned there were tens of thousands of asteroids nearby which could cause an apocalypse on Earth. Proving to us the Biblical nature of such a threat, we hear in the 3rd video below why our videographer believes this recent announcement proves the accuracy of the Bible and Revelation 8. Back on October 14th we reported in a story on ANP that Barack Obama had recently signed a new executive order ordering the US government to prepare for ‘space weather’ chaos. Certainly a large asteroid striking our planet will unleash ‘chaos’ like never before in modern history. 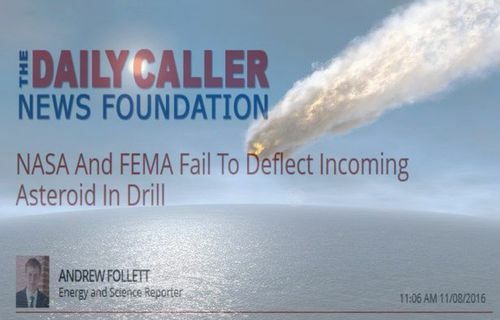 In the first video below we hear the Daily Sheeple’s discussion of the recent asteroid drill in Los Angeles while in the 2nd video below, our videographer asks what is really going on with all of this recent news. The final video, a National Geographic documentary called “Stopping Armageddon,” takes a look at the very real probability that sooner or later, a giant space rock will wipe out civilization. 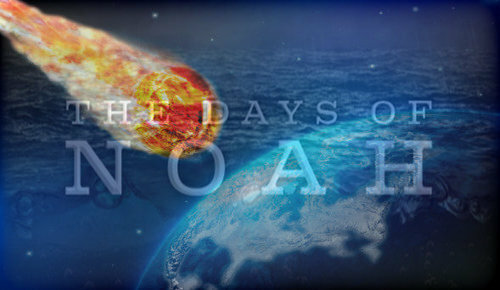 Analyzing the threats we face and exploring the avenues of ‘stopping Armageddon’, we pray this preparation is never needed and Earth and humanity are guided out of danger by His hands. Why America’s Annihilation Is Assured Even If We Defeat Russia In World War 3 – Is That Why They’re Prepared To Move The US Capitol To Denver?